Imagine "The Illusionist" crossed with "Ocean's Eleven"! Jesse Eisenberg has "agreed in principal" to star in "Now You See Me," a magician-heist thriller to be directed by Louis Leterrier ("Clash of the Titans"), reported Variety. Meanwhile, there's still an offer out to Jake Gyllenhaal for the film's other lead role. The film is about a group of world-class illusionists who use their performances as cover for pulling off huge bank heists, and then having the cash rain down on their audience. Naturally, this type of behavior attracts the attention of the FBI. We're having a hard time envisioning how this works--where are the performances? Where are the banks? How do they make money robbing banks and giving away a huge chunk of the loot? 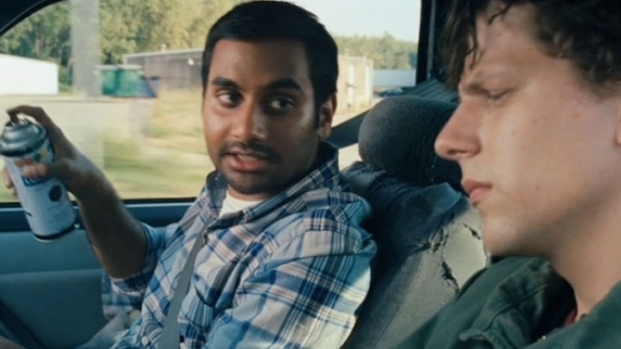 Jesse Eisenberg and Aziz Ansari star in this caper comedy. But, hey, Eisenberg learned plenty about bank robbing from his role in the upcoming "30 Minutes or Less," so we trust his judgment.